Last week's break from writing in the Lake District did the job as I've managed to write two stories since I came home on Sunday. I came home from the Lake District refreshed and have managed to write two short stories (you can read my post The Perfect Writing Break here) which is just as well as at the weekend, my husband and I are sneaking off to Hayling Island for our annual modern jive weekend... yippee! 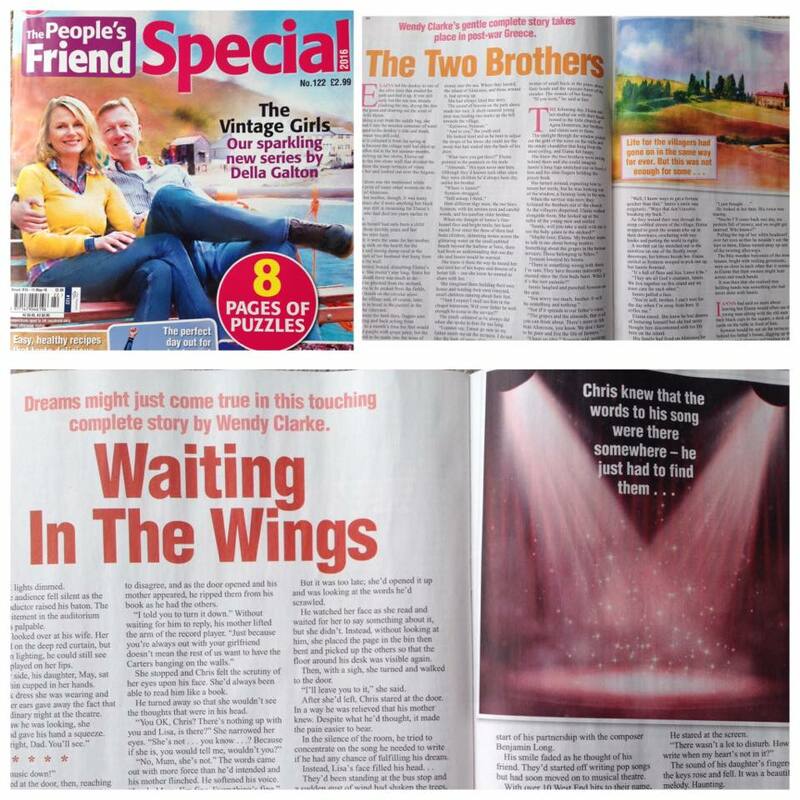 Today, I saw that I had two stories in The People's Friend Fiction Special. Both of these stories have stories attached to them (if you see what I mean) and today I though I'd tell you the inspiration behind one of them, The Two Brothers, as it is particularly dear to my heart. As most of you will know, the last year has been spent writing my novel. It's been a steep learning curve, getting enough done to submit it to the RNA New Writers' Scheme, finishing it, writing a synopsis, sending out submissions in order to find an agent for it and, most recently, doing considerable edits and writing a blurb for the agent who believed in me and my writing. My novel, at present called The Marbled Book, is set mostly on the Greek island of Mystos. Now Mystos doesn't actually exist, but it is based on the islands of Skopelos and its smaller sister Alonissos (as well as parts of other islands I've visited over the years). When I wrote the book, I'd never been to either of these islands but pictures I'd seen of them during my research looked perfect. By September, when the novel was almost finished, my husband and I decided to visit the islands in order for me to complete the research. I would be able to immerse myself in the sights, sounds and smells of the two islands (you can read my blog post on it here). Whilst on a day trip to Alonissos, I discovered there were two smaller islands off the harbour town of Patitiri. They were called The Two Brothers. All through the holiday, the question floated around in my head - why were they called the two brothers and could I make them into a story when I got home? I didn't want the story to be contemporary (it would have encroached on my novel) so I decided to set it just after the second world war. A guidebook I'd bought had mentioned the failure of the grape harvests around that time and I decided to work my story around this. 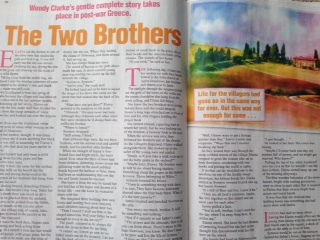 Of course, as the title suggests, the story is about two brothers. It's a love story but also one of sibling rivalry. But what of the two small islands of the same name which I mentioned earlier? Well, legend has it that there were once two giants called Otus and Efialtes. When they were children they liked to play at skimming stones into the sea. From these pebbles grew the Sporades islands. I knew it would be a perfect story to weave into my own fiction. The special will be out for the next three weeks if you want to find out more about the story. Yesterday my husband and I came home from our holiday in the Lake District. It's our fifth visit and, as always, we wonder how this beautiful place escaped our radar in the years preceding our first holiday here eight years ago. Apart from one year, when we rented a cottage in Troutbeck, we have always stayed in the same row of slate miners' cottages just outside the tiny village of Chapel Stile. Each year, we think of staying somewhere else but the truth is, we just can't imagine anywhere being as perfect (and the view of Lingmoor Fell from the bedroom window would be hard to beat). This is the third year we've visited the lakes in April and I think it is probably my favourite time of year: daffodils are everywhere, the fields are full of lambs and the changeable weather makes every day different. We were a little worried about how Bonnie would cope with the long walks, as she is getting a little older, but we needn't have worried - I tired long before she did! I celebrated my birthday while we were away and one of my presents was a FitBit. The reason I wanted one was to help me walk the 10,000 steps recommended each day for good health. 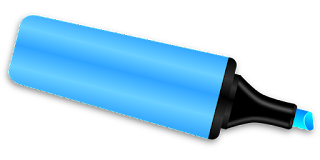 As writers, we sit for long periods of time and this particular model vibrates if it senses you haven't walked for a while. Of course my first week was a little exceptional as we were walking between six and eight miles every day. In fact, I walked enough steps to earn a 'Marathon Badge'... whoo hoo! I mustn't get too excited though as it will probably never happen again. I suspect my FitBit is going to be very disappointed in me next week once I get back to writing again. 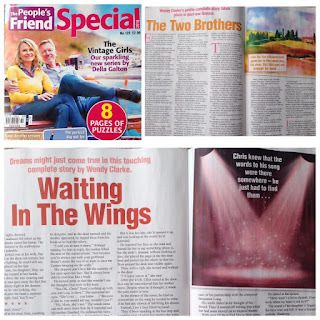 It's been a busy time for me recently with the excitement of finding an agent and doing the first round of novel edits alongside my magazine stories. With this in mind, I made the decision to have a complete writing break while I was away. For the first time, it didn't make me feel guilty. I know now that these breaks are good for me. So it's back to work with recharged batteries, a head full of stories and memories of the beautiful fells and lakes. I'm missing them already. Yesterday, I was out of my comfort zone. The reason for this was I went to see Jackie the Musical and I have to say that although I had read lots of very good reviews about the musical itself, I was rather nervous about going. The problem was, I had made the mistake of reading a review which said that the atmosphere (in that particular theatre on the tour) was like a hen party, that the audience was all women and that there was a lot of audience participation. It didn't help when fellow writer Helen Yendall who saw it recently too, told me that she and her friends had gone there wearing Rubettes caps. Thanks Helen! Now, anyone who knows me will also know that a) I don't do dressing up b) I don't like large gaggles of women (hen party style) c) I don't do audience participation. What was I to do? All day I worried about it. Would I hate the whole experience? Should I give my ticket away? In the end I looked at it rationally. When I was a teenager, I loved Jackie and would count down the days until the weekly issue came out. I made up problems for 'Cathy and Claire' (which I never sent) and stuck the pictures of David Essex and Marc Bolan on my wall and read the stories avidly. I had to go. Of course I did. So, at 7.30 last night, my four girlfriends and I walked through the doors of the Theatre Royal in Brighton. If I was expecting to see legions of drunk women wearing Bay City Roller scarves and platforms, I was disappointed (well, actually I wasn't). What I found instead was a foyer full of regular theatre goers in normal clothes. There were also (surprisingly) quite a few men. I loved the show. It was such fun and so nostalgic and there was such a lovely atmosphere in the theatre. I was instantly transported back to those days of catsuits, chain belts and blouses with huge collars. Which made me think - what if I'd gone with my instinct and chickened out. I'd have missed a great experience. Being out of my comfort zone is something I try and avoid, but I suspect that as my writing career progresses, I might find myself having to do things I'd normally shy away from. If that happens, I shall think back on my Jackie experience and remember that sometimes things aren't as bad in reality as they are in your imagination. 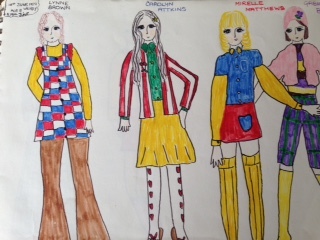 I wanted to find a photo of myself in the seventies but found that the best ones had turned orange! Instead, I have illustrated this post with photos of some drawings I did in the 70s. 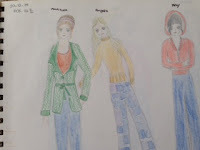 The girls I drew are a great representation of the fashions of the time. 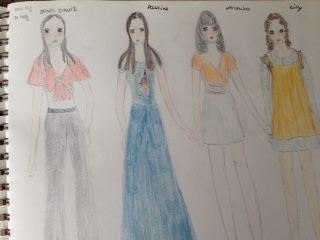 They were drawn between the ages of 12 and 15. 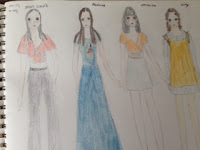 My sister and I spent hours drawing them and I'm so glad I kept the books. Did I ever mention I wanted to be Suzi Quatro? Now a random fact: Jackie mag was published by D C Thomson - who publish The People's Friend (who I am a regular writer for). I didn't know that until I read the programme and I think that's rather fitting. Tomorrow (Sunday) is my birthday and we will be spending it in the Lake District. It's one of my favourite places and perfect timing after all the work I've been doing on the novel. I'll be having a complete break from writing and hope to return with re-charge batteries. See you all next week when I return. On Thursday 18th of February (you see it's etched on my memory) you may remember I went up to London to have a meeting with Eve White of the Eve White Literary Agency. You may also remember how excited I was when I was offered representation by them. To have an agent like your work enough to represent you feels like such a huge milestone that it is easy to think you have come to the end of your journey. As soon as you come back down to earth, though, you realise that this is far from the truth. Having representation is just the first lovely step on a long, long ladder. So what have I been doing in the month since I wrote my excited blog post 'Out of the Slush Pile - how I found my agent'? This is what I've been doing... editing... editing... editing. These days, a novel is very rarely accepted as it is. A lot of the changes and edits that might once have been done after the book found a publisher, are now done beforehand with the guidance of the agent. The idea is to give the novel the best possible chance - and the agents know the market inside out. Today, I finished my first round of edits. That might not sound like a huge achievement - but it it is to me. You see, part of my agreement with the agency was to make quite significant changes to the novel. In fact, I had to take out a complete viewpoint (a rather heart-wrenching 30,000 words). This was not as simple as it sounds as all the key information in the edited parts needed to be redistributed. Instead of seeing the second protagonist's actions through their own eyes, the reader would now have to discover these things through the conversations of other characters, letters, emails etc. I have to admit I was a bit daunted at first but I knew I needed to make a commitment to the changes. They wouldn't work unless I had faith that they would make the novel stronger (after all, my agent knows the publishing business a whole lot better than I do). Since starting the work several people have asked me how I went about making the changes so I thought I'd tell you here on the blog. 4. Beside these, I jotted down ideas of how each particular bit of information could be imparted e.g. the name of a character, letter, email etc. 7. I worked methodically through each chapter, ticking things off as I went on both my chapter headings and the printout. 8. I made notes as I went of things I needed to check once it was all done. 9. I put the revised novel onto my kindle and read it for continuity. I have to admit I was rather nervous when I started reading. What if I didn't like the new version? What if I thought it was better without the changes? Luckily, I had to agree with my agent... the novel had a different feel to it but it was all the stronger for the changes. It's now sent and I'm just keeping my fingers crossed that my agent likes it too. If not... it's out with the red pen and scissors again!